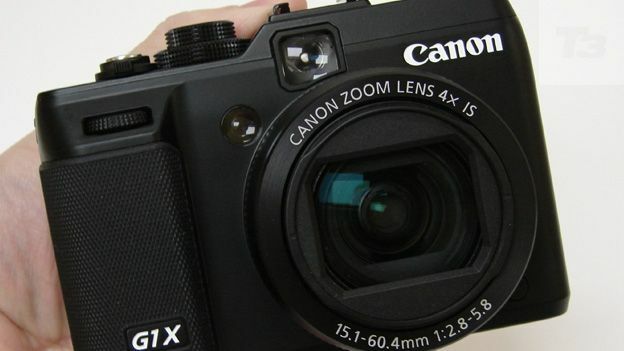 Can the 14 megapixel Canon G1 X measure up to its Canon G12 sibling? The Canon PowerShot G1 X is a metal-bodied premium compact crammed full of features, but does it live up to the standards set by the Canon G12? Aimed at photo enthusiasts and not to be confused with the Panasonic PowerShot GX1 compact system camera, the Canon PowerShot G1 X is a brick-like premium compact that is resolutely of the fixed lens (non-interchangeable) variety. Its blocky design, plus 'bells and whistles' control layout that falls between a snapshot camera and a fully blown digital SLR, very closely recalls its predecessor, the Canon G12. This is a serious camera for serious times. Current high-end competitors include the newly announced Nikon Coolpix P7100, the Fujifilm X10, the Panasonic DMC-LX5 and the Olympus XZ-1. Curiously, at the time of writing, Canon doesn't offer a compact camera on which the lens can be swapped – so this is the nearest the range gets to (claimed) pro quality before you make a step up to a digital SLR. No wonder then that Canon is referring to the G1 X as its 'master compact'. It features a large CMOS sensor offering an effective resolution of 14.3 megapixels. The sensor is of similar, if not exact, proportions to the APS-C sensor featured in entry level DSLRs: namely 18.7x14mm as opposed to 23.5x15.7mm. A bigger sensor equals better quality, theoretically. And, while you're 'stuck' with the one lens on the front, it's a usefully image-stabilised 4x optical zoom with a focal range - the equivalent of a wide angle 28-111mm on a 35mm film camera. The maximum lens aperture is a bright f/2.8, which, when coupled with maximum 12800 light sensitivity should make this a capable contender for low light handheld photography. That's just as well, as with pricing in the region of £699, the same as a semi pro DSLR, we're expecting big things. Though the metal-bodied Canon G1 X's control layout looks packed at first glance, in fact it's approachable and buttons are well placed and sufficiently large for accurate function implementation. There are elements taken from Canon's point and shoot cameras like the back plate scroll wheel, while the front command dial recalls a DSLR. Inspiration is even taken from rangefinder cameras, chiefly via its top plate dials. On the G1 X, a five pence-sized shooting mode wheel with 10 manual and auto options sits atop a ten-pence piece shaped exposure compensation wheel, offering +/- 3EV in incremental steps. Both dials are stiff to the touch, so there little chance of accidentally slipping onto a setting we didn't want when merely fetching the camera out of our bag. A lever for operating the zoom encircles a raised and springy shutter release button. This has just the right amount of give to enable any user to determine its half-way point when focusing, while an instant record button for Full HD 1920x1080 pixels video at 24 frames per second (fps) sits top right of the backplate. This also falls under the thumb. Such positioning might also give rise to accidental activation, were this button not thoughtfully encircled by a raised piece of plastic to stop this happening. Generally the G1 X makes it easy to 'get at' all the camera's functions, and anyone who has handled PowerShots lower down the range, or even an entry level DSLR, will find much familiar. As is increasingly the case on high-end compacts and low and mid-end DSLRs, the G1 X's back screen is angle adjustable. Here the 3-inch, 920k dot resolution LCD can be flipped out at 180° from the body to effectively shoot around corners, or turned so the monitor is facing front of camera for self-portraits and group shots. Furthermore it can be tilted up or down to achieve otherwise awkward low or high angle shots. It can even be flipped so the screen is facing inwards to the body for added protection in transit. As if this wasn't enough, we also get an easily overlooked viewfinder window directly above the LCD as an alternative option for composing shots. This doesn't provide the more precise through-the-lens (TTL) view that the LCD does, and the edge of the lens barrel intrudes in the bottom left hand corner of the view. It's a moot point, as arguably thanks to the screen's flexibility a separate viewfinder isn't essential here. Enthusiasts will appreciate the option anyway, and others that they have a fallback in sunnier conditions. The Canon PowerShot G1X packs an NB-10L lithium ion rechargeable battery in the base of its handgrip, shared with a slot for all variants of removable SD card media. This provides sufficient power to shoot up to 250 photos, a performance on a par with the average snapshot camera rather than a DSLR. It does also fall short of the 370 shots offered by the outwardly similar Canon G12, albeit packing a different battery. Not terrible but room for improvement here certainly. With a chunky handgrip and roughened lens surround enabling a steady two-handed hold when shooting or recording, the large and bright aperture lens on the front of the G1 X suggests itself as useful for taking portraits and close ups with available light – and so it proves. It comes close to its claimed DSLR quality in the sense that in such circumstances some eye-catching shallow depth of field results can be achieved – blurring the foreground and back ground so the viewer's eye is immediately drawn to the sharply focused subject in the centre. In this way we were able to get some professional looking results that looked less like the snapshots the camera otherwise delivered when we were shooting general scenes at maximum wide angle. In these circumstances, if left to its full auto mode the camera will either bias the foreground in terms of exposure and leave the sky featureless, or vice versa, drawing detail from clouds in the sky but rendering the foreground a dark smudge. The G1 X is therefore a camera that benefits from the user exerting some control - one thing its target audience will be itching to do. Moreover uncompressed Raw shooting is offered alongside regular compressed JPEG, so there's also the chance to adjust exposure in post production. Maximum burst shooting of 4.5 shots per second isn't up to the 10fps now offered by most premium compacts, but looks better when compared to 3fps on a starter DSLR. At the outset we said that on paper this camera looks adept at low light photography, with a maximum ISO12800 setting accessible at full resolution and Canon making impressive claims for the G1 X's high sensitivity sensor and noise reduction system. In practice, though there is inevitably grain visible in the shadows at top ISO12800 setting, the picture doesn't break up like we're used to. In fact edge definition holds together remarkably well. If you've a steady surface or tripod therefore, this is a camera that will help you 'see' in the dark to get pictures and video hitherto unobtainable. Here video has the advantage of stereo sound, but, since the microphones are positioned either side of the lens, the latter's action is much slower when recording has begun. Canon no doubt hoped to avoid the mics picking up too much in the way of mechanical noise as the lens barrel lethargically glides back and forth. The large, bright lens produces video with almost dream-like filmic quality beloved of current TV period dramas. Like the chunky look and semi-pro feel of the older Canon G12 model, but previously held back because of the modest 10MP resolution and small-ish sensor? Then the new 14MP Canon G1 X will be the camera for you. Again, like nearly every compact camera, with the possible exception of the interchangeable lens Sony NEX-7, this isn't a direct replacement for buying a DSLR. More likely it will form a capable and more portable back-up for existing Canon users. Those who don't fall into that category but still want very-close-to-DSLR image quality and video may be better served with a compact system camera like the Panasonic GX1, Olympus E-P3 or Nikon V1. However if you already own a DSLR or CSC and still have cash to spare, or don't care about building up a collection of lenses, the G1 X might just tempt an additional purchase.